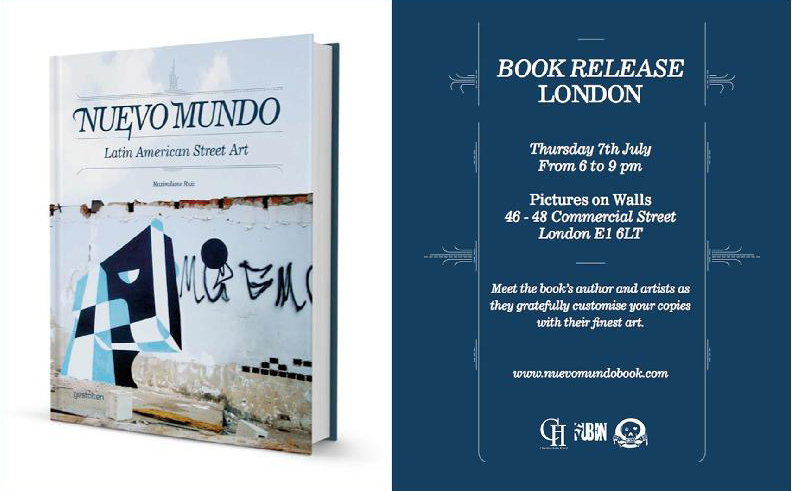 This evening marks the London release of the 'Nuevo Mundo: Latin American Street Art ' book which will be hosted by Pictures on Walls. Meet the book's author Maximilliano Ruiz and a number of the artists as they gratefully customize your copies with their finest art. Copies of the book will be available at a one night only special price. You can see some preview pages from the book here. Attendant artists include: Thiago Alvim, Yusk (Brazil), Don Lucho, Saile (Chile), Stinkfish (Colombia), Jorge Rodriguez-Gerada (Cuba), Buytronik, Cix, (México), Basik, Physe and Wesr (Perú). Book Launch Thursday 7th July from 6 to 9 pm.